This property is no longer available for rentals. Please call 0049-89-833084 for alternatives. This nicely decorated vacation apartment is on the first floor of a 18th century building near the presidental residence Quirinale and within walking distance to the famous Fontana di Trevi. At the renovation, much attention was paid to combine modern comfort and charming antiques. The double bedroom and the twin bedroom share one bathroom. Both bedrooms lead to the tastefully furnished living room, inviting to cosy evenings. In a niche there is the open and fully equipped kitchenette. 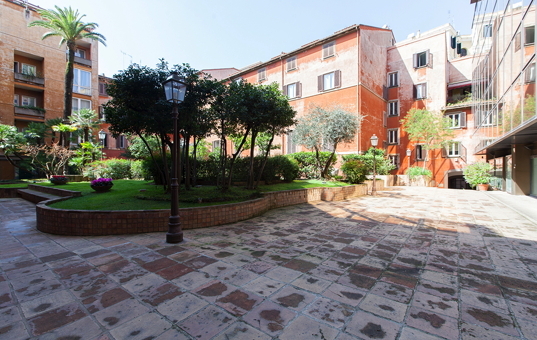 This apartment is an ideal base to inquire this lovely city and its historical center. The minimum rental period for this attractive apartment is four nights. The rental rates are charged by the number of nights.